Sam Bethea, a.k.a. the "Jesus Saves" guy, can be heard nearly three city blocks away. WFAE listener Kirsten Huntley was curious about his story. 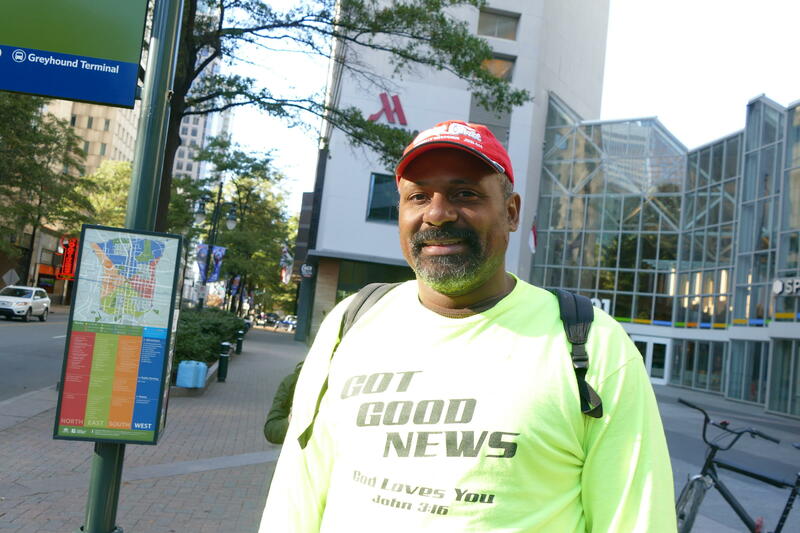 She sees him at the corner of Trade and Tryon Streets nearly every afternoon, recently with a "Jesus saves" pedicab. How did he find his mission, and how does he manage to make his voice so loud? "On a quiet day, I can hear him from the 22nd floor of my building!" she tells us. In this installment of FAQ City, we'll meet up with the man himself and ask him how he was introduced to the faith. The story, he says, goes back to when he was an employee at a local Walmart, and got to talking with an old man not unlike Mr. Magoo. He'll also tell us about some of the trials and tribulations he's endured, including getting pushed into a fountain by a group of rival street preachers, and defending his crusade on television when a group of business-owners considered restricting his hours in uptown — some considered him a noise disturbance. Ask how he feels about becoming one of Charlotte's most recognizable figures in uptown, and he'll shrug it off. "People try to say I'm a celebrity," he says, "I say no, I'm a servant." And ask what he hopes his legacy will be, and he'll answer with a laugh: "Jesus saves! You know? Plain and simple." Special thanks to some friends of Sam heard in this episode, including Elliot Middleton, Sylvia Jones, Jamar Holmes, River and Orlando. And hey, if you have a question about an interesting person, place, or slice of culture in Charlotte, let us know! Submit your question in the box below, and we may be in touch!